These were the things I did to earn money, before the age of 17. Let me elaborate on my money-making adventures. I drove my first farm tractor at the age of 5, with adult supervision. By the ripe old age of 6, I was driving by myself. This was not uncommon in a Midwestern farming community. My job was to drive a Ford Type N tractor at a speed of about one mile per hour while pulling a hay wagon. My uncle, who was the farmer, and my grandfather would be walking on either side of the wagon, loading the hay bales that were baled earlier that day. I mention the Ford Type N tractor because my uncle had two of them. One was 14 horsepower and the other was 16 horsepower. They were small tractors but were very common in the mid 50s. (Later in life, I owned a riding lawnmower with an 18 horsepower engine!) We did not have any of those large Farmall, John Deere, or Massey Ferguson tractors like many of the local farmers. We stuck with the Fords. That was it. I started my tractor driving career pulling a hay wagon. Many of my first grade classmates were experienced at cultivating and plowing with the much larger tractors. I was envious. That was life in a farm community. Everyone in the family pulled their weight and contributed. My first dip into an entrepreneurial enterprise was trapping pocket gophers. My grandmother taught me how to trap these malicious little rodents. Here is how you do it. First, you find a newer ‘gopher pile.’ This was not very challenging as there were plenty of them on our farm. You brushed the dirt off the pile. Then you prodded with a stick to locate the gopher hole. This was indicated by softer dirt. Once found, you used your hand to dig out the dirt until you found the tunnel. If you were really lucky, you found a tunnel that was ‘T- shaped’. If you were unlucky, you found the gopher! I never did get bit in the thousands of traps I set. You then scooped out dirt big enough for your trap at the intersection of the ‘T’. You set and staked the trap and then covered the hole with sod and dirt so that no light shined into the tunnel. That was it! I would have from 12-20 traps on my trap line. I checked them at least twice a day. Once a gopher was caught, I would have to reset the trap in another pile. I would capture 6 to 10 gophers a day. It would take me about 3 to 4 hours a day to do this trapping. The more gophers I caught, the longer it took, and the more bounty I collected. You could say I was a ‘commissioned’ trapper! I was an experienced trapper by the time I was 8 years old. Because I was so good, we virtually eliminated the farm gopher population, thus effectively putting myself out of business by the time I was 10! Big Daddy G expected me to keep our lawn cut if I were to receive my 50 cent allowance. I got that allowance every two weeks. We had a 22″ push lawn mower which required the old style rope pull. This had the exposed flywheel which would not pass any safety requirement today. The real danger was snapping yourself in the face with that damn pull rope. It happened many times. Our lawn was over an acre and it took 8 hours to cut. I started cutting the lawn at age 8. I did this until I left to go to college. Ironically, Big Daddy G bought a large riding lawn mower the very next week. I cut other lawns for money as well. I washed new cars at the local car dealership for $1.00 per hour. I baled hay for other farmers for $1.00 per hour. Another entrepreneurial venture was planting and picking cucumbers. My grandmother and I planted and picked one acre of cucumbers. To do this, the seed was gotten from the local ‘pickle merchant.’ Then a contract had to be signed stating that we would plant, care for and pick these cucumbers. I signed my first contract when I was 13 and did it for 5 summers. Grandma and I would go picking by 6:00 AM before the sun was high and the temperatures spiked. We would pick half the field each day, every day for the entire summer. It took about 4 hours a day. You had to do this because if the cucumbers got too big, the amount paid went down significantly. Those little jars of sweet gherkins that you buy for $3.00? We got paid $6.00 for a hundred pounds of those. We made money. I would make about $400-$500 per summer. This was huge earnings in the early 60s. Once I was done with picking cucumbers every day in the late morning, there was time for trapping, baling, washing cars, gardening or whatever. I had over half the working day left to make more money. What lessons can be learned from all of this reminiscing? Firstly, never be raised on a farm! Just kidding, of course. I would not change one thing about my youthful upbringing. With this in mind, why does this country still have so many people living on and receiving welfare benefits without doing one thing in return? Why does this country have so many people receiving extended unemployment benefits without doing one thing in return? It gores my bull (yup, we had cattle) when our Federal Government continually talks about reducing our military or social security, but never talks about cutting welfare! Welfare in this country at the state and federal level costs this country over $1 trillion a year! It costs the federal government over $750 billion. The federal government has 83 different agencies to dispense welfare to targeted groups. Does this appear to be ludicrous? The military costs the federal government about $540 billion a year. Social security costs about $725 billion, and medicare costs about $480 billion. Welfare is the largest gorilla in the room, and it has increased almost 400% in the last 30 years. Do we really want to reduce the military in light of what is happening in the Crimea with Putin attempting to replicate the old USSR, and with our continual terrorist threats? Common sense tells me that this is dangerous. President Clinton passed a law called the Personal Responsibility and Work Opportunity Reconciliation Act of 1996. It put a cap on welfare payments of 5 years. There were programs in place to educate and make these welfare recipients desirable employees. This law was a great step in the right direction. This is a law that exists in our great land, but it is not being enforced! Over 20% of the people receiving welfare have been on much longer than 5 years. 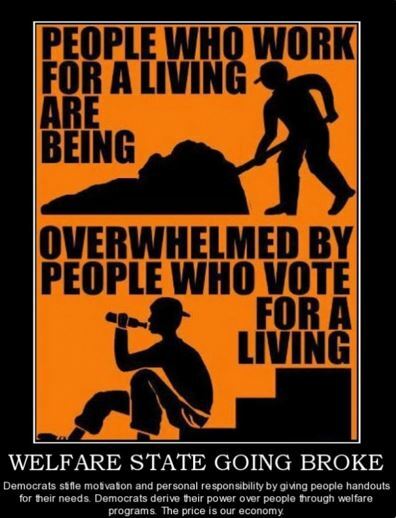 Why do we not require welfare and unemployment recipients to perform tasks in return for their government support? With the aging of the population thanks to my generation of Baby Boomers, there are many tasks that could be performed. Shoveling sidewalks or cutting lawns for the elderly. Daycare services for working mothers. There is no shortage of garbage in parks or trash along roadways or beaches. I see convicts doing some of these items, why not welfare recipients and unemployment recipients? Don’t want to work? No benefits! Unfortunately, our liberal representatives in Washington have provided a host of ‘designer benefits’ for their constituents. Obama phones, Obamacare, extended unemployment benefits, extended food stamp benefits, voter privileges for convicted felons (Haven’t heard of this yet? It is under consideration by our Attorney General. ) are all socialistic programs ‘designed’ to expand their base, thus keeping them in power. It does not take a rocket scientist or a pickle picker to realize these people receiving benefits are not voting Republican. People that are capable of working should be working. From responsibilities of my youth, I obtained a work ethic and learned independence and responsibility. Welfare and other government entitlements were never intended to become a lifestyle. The unemployed certainly could learn the lessons of my youth. Or, I could teach them how to trap gophers. This entry was posted in Common Sense, Common Sense Solutions, Congress, Growing Up in America 65 Years Ago, Political Insight, Political Opinion, Politics, welfare and tagged Growing up on a farm, trapping gophers, welfare programs, welfare recipients, Work as a teenager, work ethic on March 15, 2014 by Grandpa T.
The ‘Grass Roots’ Political Process – Don’t Walk on the Grass! Can you name the Governor of your state? Do you know the name of even one of your US Senators? Who is the United States Secretary of State? Can you name the Vice President of the United States? For extra credit, can you name the second US Senator representing your state? Admittedly, most of the people that will ever read this blog will know the answers to the posed questions. But let us take this one step further. How many people that vote can answer the posed questions? I very much doubt that half of our voting public could answer these questions. My estimation would be that approximately one-third of our citizens could answer these questions correctly. This is strictly my personal estimation. But yet these same uninformed people are electing our representatives at every level of government. Never mind that I did not pose any questions about the Declaration of Independence or the Constitution. What percentage of people in the United States would have read either document? I am concerned that some of our federally elected representatives may not have read either document, and yet they are sworn to protect and uphold them. We could attempt to require all voters to take a simple exam such as mine before they are given the right to cast a ballot. Call it a poll tax for idiocy. Or, we could implore people to become more informed before casting their ballots. Let me tell you what Grandma P and I did in 2004. 2004 was a presidential election year, with George ‘Dubya’ Bush running for reelection against John Kerry. We decided to get involved with politics at the ‘grass roots’ level, so we attended our precinct caucus. This is the lowest level of political participation at the smallest form of government. Our precinct had approximately 2,000 voters. About 30 attended the caucus for the Republican Party. The Democratic caucuses were being conducted on the same nights. Our precinct caucus had an auspicious beginning, as the moderator conducting the meeting wore a huge belt buckle with Darth Vader on it. It was weird, but he was competent. At this caucus, we were presented with a list of items that were proposed for inclusion on the ‘party plank.’ This is not a piece of building material, but a list of goals and beliefs that are to be the foundation of your political party. We read this list, which, if I remember correctly, was about 50 items long. We were then asked if we wanted to make any amendments, changes or additions to the ‘party plank.’ This promoted some excellent discussion. After about two hours, Darth adjourned the meeting and we were allowed to return to the Death Star, alias our home. We were informed that the next level of caucus was the county caucus which was to be held about two weeks later. We were encouraged to attend. Two weeks later, we attended the two-day county caucus held in a school auditorium in our county seat. It was a rainy weekend, and there was nothing better to do. This is where politics got interesting. All of the local precinct caucuses had now submitted their ‘party plank’ items. These items were massaged to form a new party plank of one hundred items. We each got a copy of that party plank. Grandma P and I looked over and cogitated on all of these items and decided we agreed with 96 of the 100 items. (Later, we saw the Democratic party plank and agreed with four of the 100 items.) We heard some excellent speeches by local and state politicians. The most important event was the election of delegates to the state political convention. Grandma P was her personable self and got elected as one of the 53 delegates. I was my usual crotchety self and got selected as an alternate delegate. The state Republican Convention was to take place in about four weeks. We attended the two day State Republican Convention in our State Capitol. Because we lived in a Midwestern state and the weather had just gotten somewhat ‘summery’, only about 40 of the 53 appointed delegates attended. As I was one of the approximately 10 alternates, we all became ‘voting’ delegates. Sadly, between delegates and alternates, we did not fill our 53 person allotment of delegates. Nice weather after a long winter proved to be more captivating than speeches conducted indoor. This convention was held in mid-June. Ronald Reagan had just died on June 5. I am pleased to report that a ten minute montage of Reagan giving speeches was shown as a tribute to that fine president. The ‘Millennials, Gen X and Gen Y’ers’ will never know firsthand the unbelievable speech- making capability of Ronald W. Reagan. It was awe-inspiring, especially compared to the speech- making capabilities of our current POTUS. He was truly amazing. He was the President responsible for the US winning the longest and, financially, costliest war in US history, the Cold War. I digress. Lo and behold, we now were presented with the latest version of the ‘Republican Party Plank’ after all the county planks were massaged. Except for a little terminology and some massaging, this state plank for our political party looked almost identical to the county plank. We heard speeches by our state officials, including our Governor. It was all very exciting, but most importantly, it was very, very informative. We got to observe the ‘grass roots’ political process from the local precinct to the state party convention. As a note, there were caucuses at the regional level which corresponded to the legislative districts. We did not attend, as we were already delegates to the state convention. There were delegates selected at the state convention to attend the Republican Party National Convention. These delegates are the same people you see on TV wearing stupid plastic hats (that are supposed to look like straw hats) and waving all kinds of banners. That year, they all had the distinction of attending the national convention in New York City, at an out-of-pocket expense of about $7500 per person for four days. For that kind of money, they could have rented a cruise ship and sailed for two weeks, enjoying the endless bacon offered on the breakfast buffet. We would have never opted to go to that convention, but we did see our first case of ‘railroading’ at any of our political caucuses. The slate for the attendees to the national convention was lead by the Governor of our state and was predetermined before we set foot in the convention center. We basically had the choice to vote for the popular Governor of our state and his hand-selected cronies or for no one else. We opted for the unanimous vote. Did I mention that the weather was very nice that day? The purpose of relating all of this? This is a very important mid-term election year. 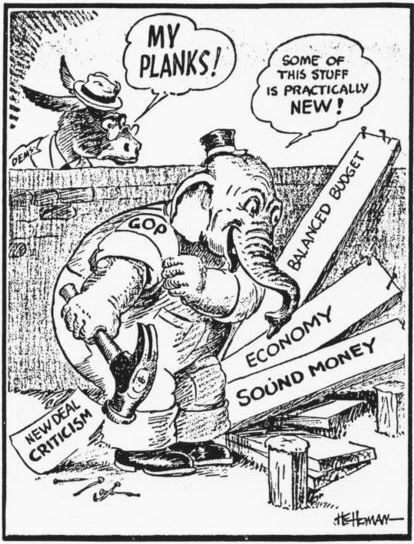 The party plank is the basis for the issues and beliefs of the party. We need to begin electing officials at all levels of government because of their capabilities, and their ability to deal or legislate the issues found in the party plank. We need to quit electing officials because of appearance (Clinton vs. Dole, Obama vs. McCain), race (Both Obama elections), gender (Hillary vs. ? ), or any other reason that is not based upon qualification. We need to inform people of exactly what it is that the two major parties are representing. I would challenge any media source to publish each party plank side-by-side. I would challenge them for two reasons: Firstly, it would probably scare the hell out of most voters that work for a living. Secondly, it would indicate how far from the party plank this socialistic administration has strayed in attempting to totally socialize this country. As this is the caucus season, I can emphatically endorse the need for each person to attend their local precinct caucuses and their county caucuses. Make your wishes and concerns known to your elected officials. But here is the real clincher. It has been determined that about 40% of this country is Liberal and 40% is Conservative. It is the 20% in the middle that the party pollsters are attempting to persuade. It is this 20% that determines who wins our elections! So here is my Grandpa T common sense advice to all you ‘independents.’ Your Independent candidate is not going to win! History indicates a vote for the Independent candidate ia usually a wasted vote. There is no room for grey in politics, choose the Republican candidate or the Democratic candidate. It’s black or white, and no, I am not talking about race. If you want to remain Independent, Libertarian, Tea Party or whatever— please take the time to read the planks of each major political party! Do this before you vote. You may not get 100% of what you want, but 90% is better than nothing. Every vote counts, but not every voter can count. Add up the candidates’ goals and beliefs. Vote for the candidate that most closely matches your own vision for the future. Don’t waste your precious vote on a dreamer that will not make it to the finish line. These issues should concern you! Take the time to acquaint yourself with each political party’s position before you vote. It is your right, responsibility and privilege as a citizen of the United States. This entry was posted in Common Sense, Common Sense Solutions, Congress, IRS, Political Insight, Political Opinion, Politics and tagged grass roots, grass roots politics, Ron Reagan, state caucauses on March 10, 2014 by Grandpa T.